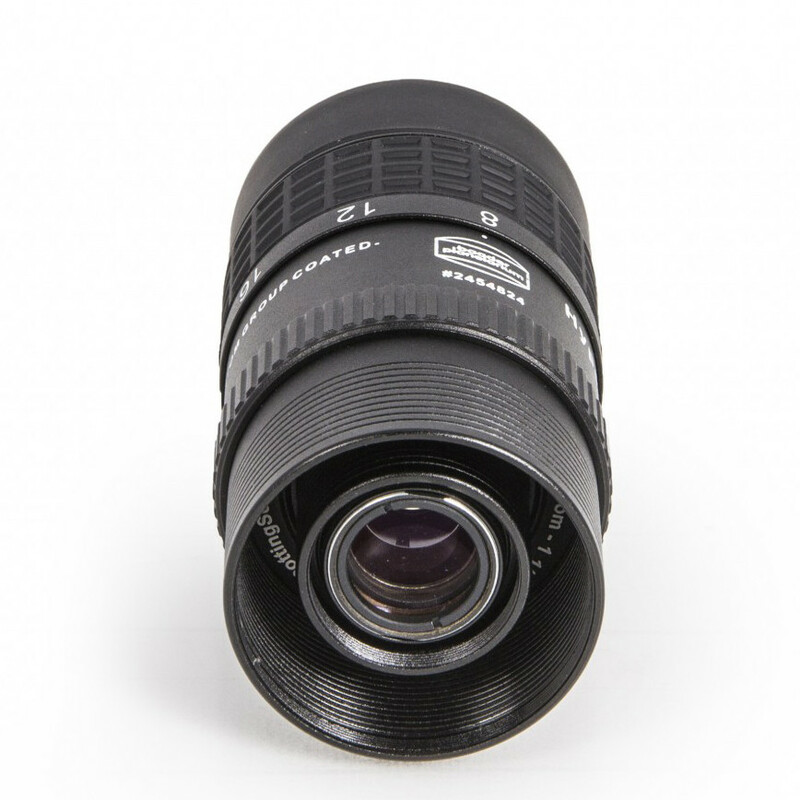 I have a Baader Hyperion 8-24mm Mark III clickstop zoom with interchangeable 1.25" and 2" nosepieces. I was using it the other night with the 1.25" configuration on my Orion 120mm f/5 short tube refractor and I couldn't get it to achieve focus at infinity with any focal length setting. The draw tube on my focuser would hit the stop (moving toward the tube) just before focus was achieved. My scope has the Orion 2" Crayford style focuser and when I use the BHZ with the 2" nosepiece it comes to focus. Any idea what's up with the 1.25" configuration? Up until the other night I had always used the BHZ with the 2" nosepiece on the refractor with no problem focusing so I was bumfuzzled when this happened. I was afraid something was wrong inside the ep so I tried it with the 2" nosepiece yesterday in daylight and it came to focus--but with the 1.25" nosepiece no joy. I use the BHZ in the 1.25" configuration with my PST and never had any problem achieving focus. I also use it at 1.25" with my C14 when I have the ADC in. I'd like to be able to use it with the 1.25" nosepiece on my 120mm ST because my SWAN filter is 1.25". The PST and C14 are both f/10--would the short focal length of the refractor have any bearing? If you are using a 2" - 1 .25" eyepiece adapter in your 2" focuser, the small additional length of the adapter probably is just enough to place the eyepiece just outside of focus when the focuser draw tube is all the way in. I forgot to mention that after I had trouble with the BHZ the other night, I used a 23mm and 17mm--both 1.25" fixed focal length eps--and had no trouble focusing. Edited by Special Ed, 11 February 2019 - 12:13 PM. There is another thread currently about not being able to achieve focus with a Hyperion 36mm and ED80. I don't see published information for Baader's focal plane reference point or positions. I suspect they are high internally in the eyepiece. 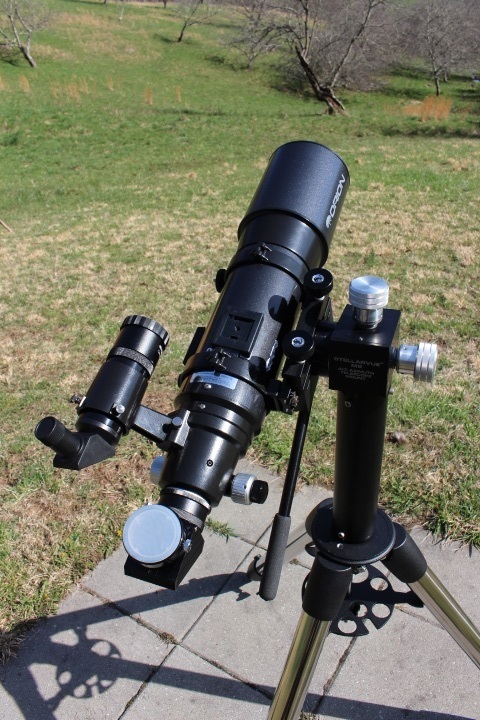 One way to figure out what is going on with the Hyperions including the zoom would be to benchmark some against the measured focal position of some TeleVue eyepieces since TV publishes their focal plane positions. The positions that are highest/require the most inward focus travel are the 31T5 and 21E at 0.38" and 17E at 0.39" above the step down to the 2" eyepiece barrel/holder. This is somewhat trickier comparing 1.25" to 2" since many adapters include several millimeters or more of additional height, but this can be accounted for. The zoom with 1.25" adapter likely suffers from the same issues that the old type I and type II Naglers did that used the dual 1.25"/2" barrels. Use in 1.25" positioned the eyepiece higher. I wonder what the operating focal length of your C14 is with the ADC and zoom...the ADC moves the focal plane something like 2+ inches on its own IIRC, which is why I don't find mine useful. I'm guessing that the combo is something over 2.5" of movement times 3x or so for the SCT mirror movement factor, for something approaching 200mm of additional focal length. I suppose that the C14's focal length is so long already that it isn't as big a factor--particularly since they were likely designed for 2" mirror/prism spacing anyway. With C8's designed for the spacing of a 1.25" prism and more standard eyepiece focal plane, the percentage change in focal length would be huge with a 2" mirror, ADC, and Hyperion zoom. Izagar and Redbetter--thanks for the input. It sounds like I might not be able to use my BHZ in 1.25" configuration with the 120mm refractor. I have another 2"-1.25" adapter (that came with the focuser). I'll try it and see if it gives me the needed distance. A low profile adapter might help? Weird that it used to work and now suddenly it doesn’t. I believe that is the same focuser as is on my older ED80 and possibly the ED80 of the poster in another thread I mentioned. The focal position for the 31T5 is only 10mm from the end of travel with my sample. The ED80 dual speed seems a rather long focuser compared to my 2" GSO's, with a long visual back section. While the Synta optical tubes are no doubt sized for it to some degree, it might be slightly different with the 120 f/5 and/or adapter that it came with. I don't know for sure that the adapter I have in the back of my ED80 came with the scope (it was a used acquisition), but it does look similar to one in images and appears to be the same duller finish rather than gloss of the 2" diagonals' adapters from about the same time frame. And it is about 22mm tall, which wouldn't work for that focuser for a 1.25" eyepiece of the same focal plane as the 31T5. This is something I have been meaning to record for my 2" refractors...the remaining focuser travel with the 31T5 using a given 2" mirror diagonal. It can be useful to know which one has a lot of room, or very little when considering different configurations. It didn't use to work. The other night was the first time I used the 1.25" configuration of the BHZ with 120mm refractor and the 2"-1.25" adapter. Before that I had only used the BHZ in the 2" configuration with no problems. @Redbetter, I will have to try different adapters but not until we get out from under this storm. Are you using the Baader zoom with a 1.25 inch diagonal or a 2 inch diagonal? As others have said, I believe the problem is the height of your 2 inch to 1.25 inch adapter. Probably the easiest solution is to use a 1.25 inch diagonal, this buys you about 25mm of inward focuser travel. Is there a particular reason that you want to use it in the 1.25 inch mode other than convenience of not having to swap the adapter when using other 1.25 inch eyepieces? I am using the Baader zoom with a 2" diagonal. The reason I changed the ep over to the 1.25" barrel the other night was because I wanted to use my 1.25" Lumicon SWAN filter on Comet Iwamoto. I thought about buying the 2" SWAN but boy, they are high $. My 2" dual speed crayford focuser came with a 2"-1.25" adapter. I will try a 1.25" diagonal and see what happens. You could use the Baader zoom as a 2 inch and attach the filter to the 1.25" barrel .You would just have to make sure there was clearance between the filter and the diagonal. Bingo! I have a 1.25" diagonal that came with my old C8 so I tried it and it worked. I had to crank the drawtube out to bring it the BHZ to focus--looks like about an inch (25mm) showing on the drawtube, just like you said. I didn't see anyway to attach the filter to the barrel (if that's what you're calling the little stub that sticks out of the bottom of the ep when you take the nosepiece adapters off) and the 2" and 1.25" adapters can't go on at the same time--I'll just use the 1.25" diagonal. Thanks for the help and many thanks to everyone for your suggestions. This is the answer. Baader makes a stop ring to keep the Hyperion eyepieces from hitting the mirror. It is necessary when using the fine tuning rings but it helps for times without the fine tuning rings too. I see. With the Mk 4, both adapters can be fitted at the same time. In that case, the 1.25 inch adapter is recessed from the 2 inch so when the filter is attached, it only extends maybe 1/8" beyond the 2 inch adapter. Since the diagonal mirror is at a 45 degree angle, there is no risk of the filter contacting the diagonal. With a prism diagonal, it is possible but unlikely and not many use a star prism diagonal with a fast achromat like the ST120. The Baader Hyperions (the prime ones, not the zoom), have a removable 1.25" nosepiece assembly that protrudes completely below the 2" nosepiece part of the barrel. You can remove the 1.25" assembly but then you change the focal length of the eyepiece. This is a nice feature but you don't always want to do that. The exceptions are the 24mm and the 36mm both of which do not have any lenses in the 1.25" nosepiece assembly. You can also change the focal length by adding one or two extension rings between the eyepiece and the 1.25" nosepiece. Again, a very nice feature to have but using any of these configurations changes the total length of the eyepiece and it can bottom-out in a diagonal when in its longer configurations. I didn't realize that the Baader Hyperion Zoom was a bit different. I now see that the 2" nosepiece screws on over the 1.25" nosepiece while the 1.25" nosepiece is still attached so the difference in the length of the whole eyepiece is minimal when comparing the 2" configuration to the 1.25" configuration. The view will still be through the 1.25" nosepiece so the focal length won't change since it remains in place (from what I can tell by looking at the product online). This should have no problems fitting into the 2" diagonal in either configuration. For the prime focal length Hyperions, the eyepiece actually goes far deeper into a 2" diagonal (with diagonal adapter removed) and, to be honest, I thought that maybe the zoom did this also. After looking at the zoom more closely online, it appears as though the 2" nosepiece screws on over and around the 1.25" nosepiece so the overall length of the eyepiece won't change much. Using the zoom in the 2" configuration will allow you to use the 2" diagonal without the diagonal 2"-1.25" adapter so this will allow the eyepiece to drop in a bit deeper providing some back-focus. When using the prime Hyperions in the 2" configuration, they can get quite long and they will bottom-out on the mirror. This is where the stop ring comes into play. And again, because the eyepiece extends far deeper into the diagonal, you gain some back-focus here as well which is necessary for some telescopes/focusers (my Skywatcher ED 72mm when used with a 2" diagonal, for instance). 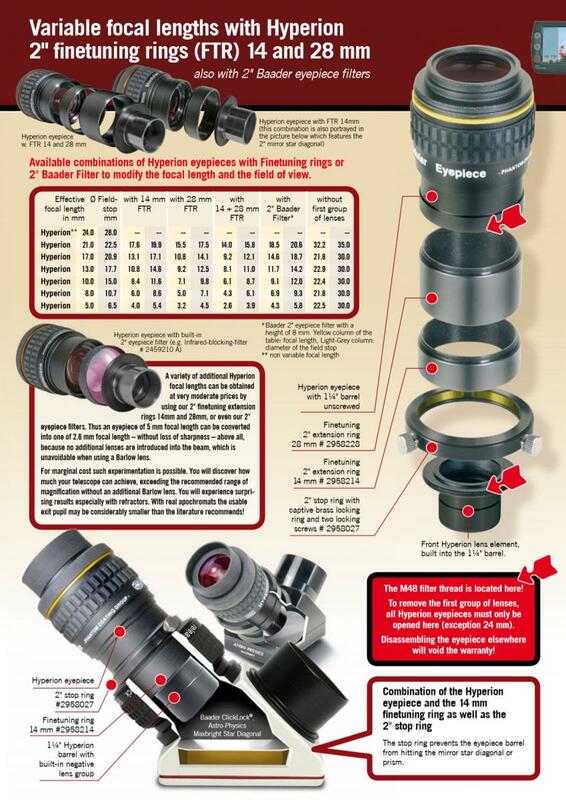 I have a screenshot from the Hyperion brochure but this one is for the prime eyepieces. I've never seen a brochure for the zoom eyepiece. This brochure shows a cross-section view of a diagonal with the extended eyepiece in the 2" configuration. This is what I was referring to in order to gain some back-focus. And, I should have added a photo of the Baader Zoom with the 2" nosepiece attached (it is one of Baader's photos of the product)... it is screwed on over and around the 1.25" nosepiece. So both are on the eyepiece at the same time. Also, it appears as though the 2" nosepiece extends a bit longer than the 1.25" nosepiece so I suspect you can use 2" filters on this as well. Scope stuff sells a shorter back to the 120ST. Very easy to swap out the factory back plate to the shorter version. Will give you more room for sure for inward travel. I had to look up an old thread to figure out the part description from ScopeStuff. Realized these only work with replacement focusers like GSO Crayford or Linear Bearing. I have the Linear Bearing focuser I swapped out (TS Monorail which is same as GSO Linear Bearing). I re-read the initial post. You do have a Crayford Focuser on it already. Maybe you are already using this adapter plate? If not, it should work. Can you post a picture? Edited by Vondragonnoggin, 14 February 2019 - 10:05 AM. I have a TeleVue 1.25" 11mm plossl. Patrick, I'm guessing that pic is a Mk IV? The adapters don't look like the ones that came with my Mk III. I used the 1.25" diagonal and the BHZ with the SWAN filter to look at Comet Iwamoto Thursday morning and everything worked fine. Thanks to all for the help and interest. If I'm going to keep using this configuration I should probably get a new 1.25" diagonal--on the old Celestron that I have, the thumbscrew sits too high on the rim of the diagonal and bangs up against the bottom of the body of the ep and is almost covered by the ep making it hard to get my fingers on to turn. I know this is the eyepiece forum but, any suggestions? Edited by Special Ed, 15 February 2019 - 02:30 PM. Yes, that is a photo of the Mk IV. Admittedly, I didn't catch that you are using the Mk III but I wouldn't have thought that the III and IV were so different anyway. I don't know anything about the Mk III version so I'm out of relevant advice. I'll be following along just out of curiosity though. Best of luck! Not the same thing but unfortunately it might require you swap out the Orion dual speed for the GSO dual speed and use the adapter I listed. The entire focuser looks longer on the Orion version. Might be too costly. Thanks for the link. My focuser is 5.9 inches long. Since I mostly use the ST 120 with my fixed length 2" ep's (with no focus issues), I believe I will just use the BHZ with the 2" adapter and spend $$ on a 2" SWAN filter (or a MK IV BHZ) rather than on a new 1.25" diagonal or a new focuser. Thanks to everyone for the good information and explanations about why my ep wouldn't focus. Lots of knowledgeable folks here.